For Natia, firing bullets at her sister's head and narrowly missing is all in a days work. After taking over the family business, her sharp shooting act is the only thing keeping the declining Orbeliani Circus afloat. When a stranger and his dog drifts into her home town of Batumi, Georgia from the Black Sea, peddling his own act, Natia wonders if a change of fortune is finally on the horizon. As the circus's prospects begin to rise so do suspicions that the stranger is not who he seems. A fateful interaction forces changes upon Natia and she must leave her family to protect them from what she is becoming. Soon, she is traveling to a different city-by-the-bay, San Francisco, where confrontation and opportunity release a violent darkness rooting within her. Fighting against her loneliness and the rules of this new world, she is befriended by a troubled young artist with an innocent soul. Will this tenuous love lead her out of the darkness? Or, are they merely two halves of broken whole? 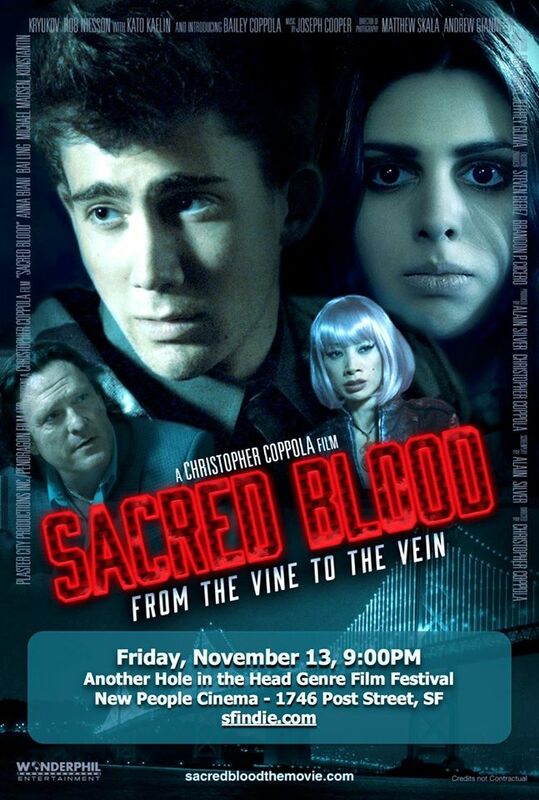 Sacred Blood is one of those vampire movies that isn’t afraid to treat the vampire characters like people, with dramas and tragedies of their own that have nothing to do with their undead life choices. The story of Natia, who is burdened with running her family’s circus after a tragedy, and her descent into vampirism in San Francisco, this is a purposefully over-the-top, melodramatic film that deals with thoughts on family, love, responsibility, and a few outside threats. Let me just say this movie looks amazing. The locations make me want to fly to California immediately to explore, the clothes are perfect for each character, and the cinematography is smart and cuts decently around some moments to imply some actions. The only thing I’d have liked here is a little more vampire in the vampires to show at a glance who is what. While the movie isn’t necessarily about vampirism but a cast that happens to include vampires, an eye change or teeth during key scenes would have punched the melodrama up a notch for me. The script is tight and forward-moving, though there are a few scenes I’d have liked expanded just a little to help explain time cuts, location moves, and a few other practicalities. Still, the emotional story of Natia, Lily, Luke, and the others kept me watching until the mesmerizing end scene. It’s obvious Christopher Coppola knows what he wanted for this movie, and he gets it by the throat. While some performances seem mismatched and a little uneven, when things click they really click. Standouts include Bai Ling who was so much fun and just hypnotized me as Lily, Michael Madsen as a well-meaning but alcoholic Brennan, Rob Nilsson as the enigmatic Ruthven, and Bailey Coppola as Luke, who was a pleasure to watch as his character was taken through his surreal journey. Billed as an operatic vampire movie without the singing, to me some moments seemed a little too muted or choppy, a little too improvised to capture the overall energy that the script demanded. I love that it treats the entire cast as people, though, be they undead or living. Sacred Blood is a fun, beautiful movie to watch, and as you go along you cannot help becoming intrigued by and hold sympathy for this strange, broken cast of characters.